Protesters stand Pennsylvania Avenue looking east toward the stage located near the Capitol during the "March for Our Lives" rally in support of gun control in Washington, March 24, 2018. You’re never too young to be a champion for change. 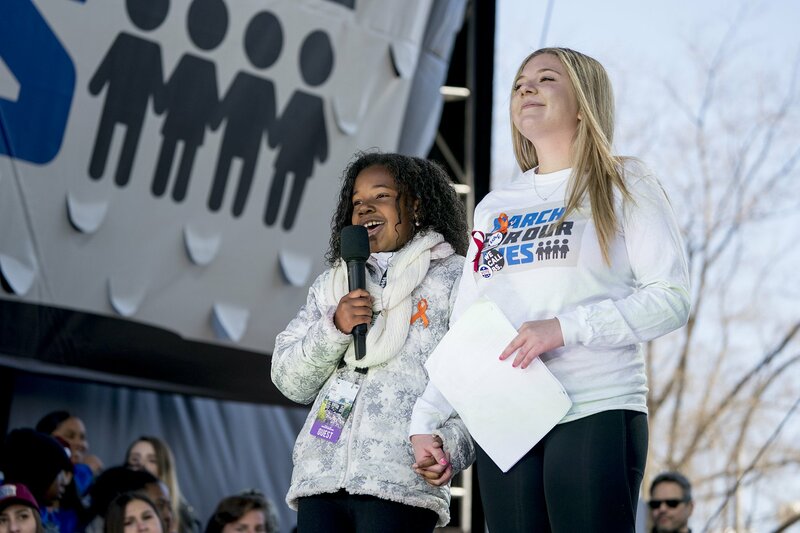 “We are going to be a great generation,” 9-year-old Yolanda Renee King told the hundreds of thousands of protesters at the March for Our Lives in Washington, DC. But Yolanda, the granddaughter of Martin Luther King, Jr., is wrong — because they already are a great generation. In recent weeks, the US has seen a massive wave of youth activism in response to the devastating shooting in which 17 lives were taken at the Marjory Stoneman Douglas High School in Parkland, Florida. The young survivors of the shooting have set an example for the world by organizing to bring about change and awareness in the wake of tragedy. And they’re not the only ones showing wisdom beyond their years, while inspiring the world to take action. 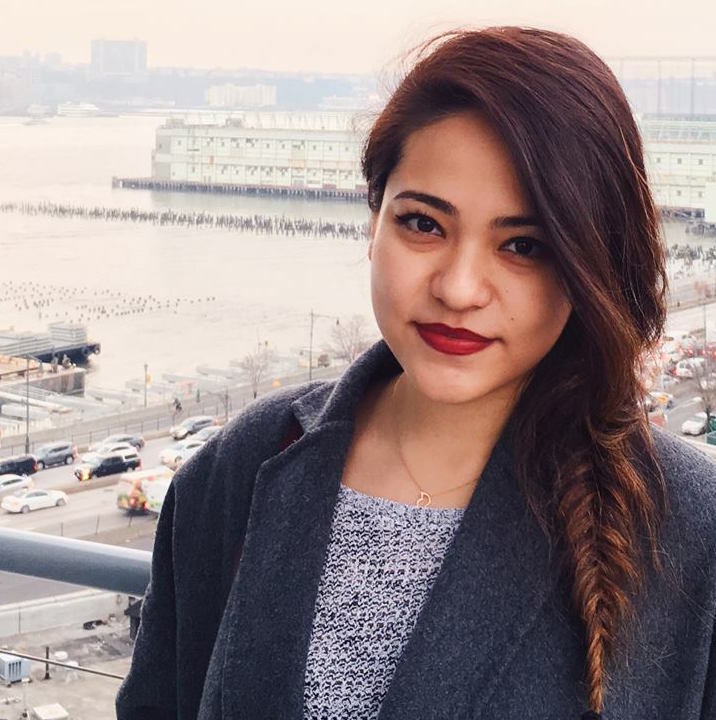 Global Citizen has rounded up nine of the most inspiring young activists leading the charge for change today. At just 9 years old, Yolanda has already begun carrying on her grandfather’s legacy. Echoing Martin Luther King, Jr.’s famed “I have a dream” speech, Yolanda got on stage at the March for Our Lives rally to share her dream. "I have a dream that enough is enough. And that this should be a gun-free world, period,” she said, delivering a speech she wrote herself. On Feb. 14, the lives of the students and families of Marjory Stoneman Douglas (MSD) High School in Parkland, Florida, were forever altered. Nikolas Cruz, a 19-year-old former student, fired at students and staff, killing 17 people and injuring 17 more in one of the deadliest school shootings ever. In the aftermath of the shooting, MSD students wasted no time in getting to work to ensure that theirs would be the last school shooting. Together, the teens united people across the nation behind the rallying cry “never again” and were a driving force behind the one of the biggest youth protests since the Vietnam War, according to the Associated Press. One of the loudest voices in the #NeverAgain movement belongs to MSD student Emma González. Just days after the shooting, González appeared at a rally for stricter gun control and called lawmakers out. 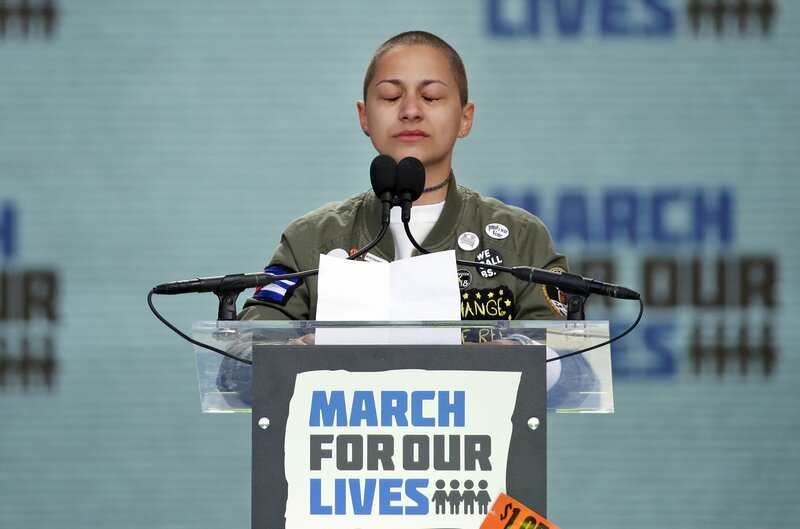 Emma Gonzalez, a survivor of the mass shooting at Marjory Stoneman Douglas High School in Parkland, Fla., stands silently at the podium during the "March for Our Lives" rally for the amount of time it took the Parkland shooter to go on his killing spree. The 18-year-old also delivered a powerful speech in Washington, DC on Saturday, the largest of the March for Our Lives rallies. Before a crowd of as many as 800,00 people, González read the names of the people whose lives were taken on Feb. 14, and then went chillingly silent. She waited until 6 minutes and 20 seconds had passed since she began speaking — the same amount of time it had taken Cruz to kill 17 people. And though González still has to finish school and plans to attend college, she’s not done fighting for justice. Back in Parkland, where the Never Again movement began, high school junior Casey Sherman helped organize the March for Our Lives, which 20,000 people attended. "It's not how you go down, it's how you get back up,” high school junior Casey Sherman told the Associated Press. Hogg has encouraged people to take action by registering to vote and holding their representatives accountable and has also criticized the media for “not giving black students a voice” in their coverage of the shooting and its aftermath. 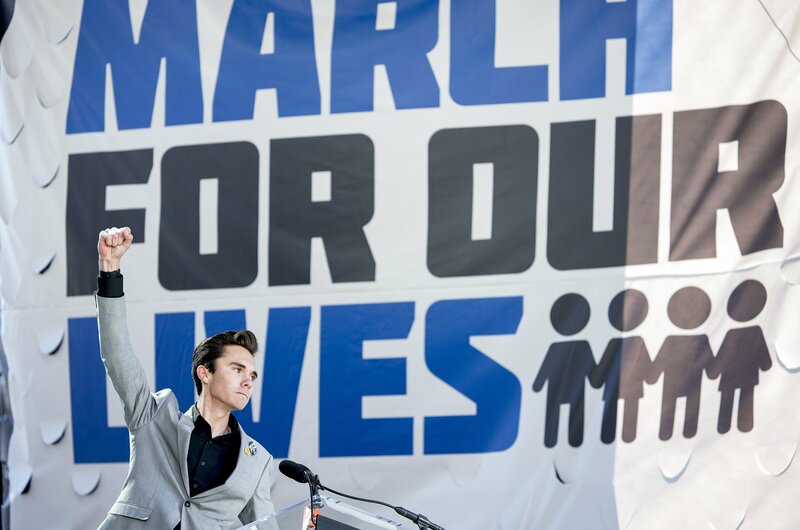 David Hogg, a survivor of the mass shooting at Marjory Stoneman Douglas High School in Parkland, Fla., raises his fist after speaking during the "March for Our Lives" rally in Washington, DC, March 24, 2018. Cameron Kasky was known as the class clown at MSD, but know the world knows him as a champion for change. Kasky helped get the Never Again movement started after the shooting, creating a Facebook page with fellow students to share survivors’ stories, the New York Times reported, and also helped organize the March for Our Lives. Naomi Wadler, 11, a student at George Mason Elementary School, who organized a school walkout at her school in Alexandria, Va., speaks during the "March for Our Lives" rally in Washington, DC, March 24, 2018. 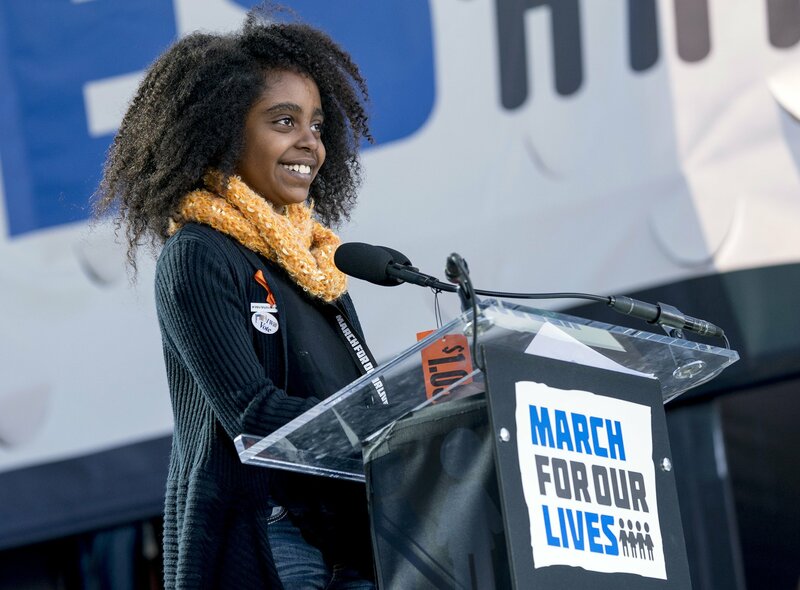 Naomi Wadler may only be in the fifth grade but when she took the stage in Washington, DC at the March for Our Lives rally, she spoke with poise and wisdom well beyond her years. Wadler not only spoke out against gun violence, but spoke up for black Americans who are disproportionately affected by gun violence. 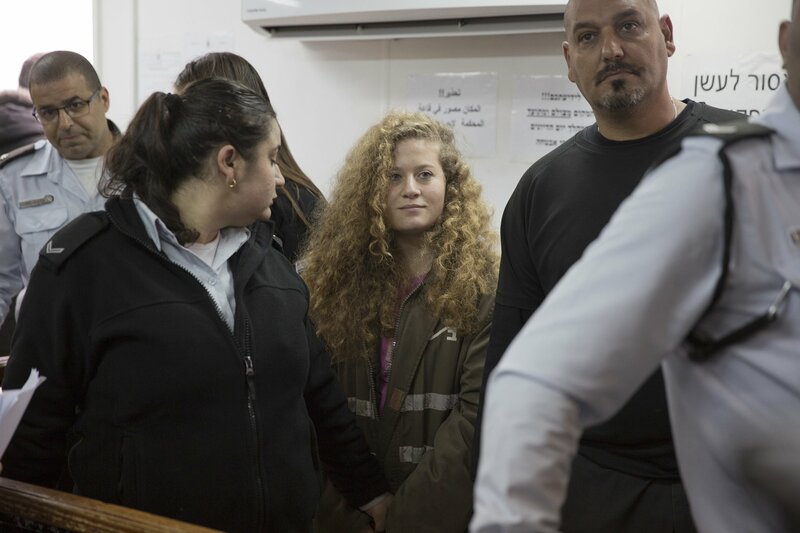 Palestinian protest icon Ahed Tamimi is in a courtroom at the Ofer military prison near Jerusalem, Feb. 13, 2018. Palestinian Ahed Tamimi first caught international attention at the age of 11, when she was caught on camera arguing with and questioning Israeli soldiers about her brother, who had been arrested. Over the next few years, Tamimi was vocal about the presence of Israeli soldiers in Palestine and their use of force. And now, at 17, is both an icon among young Palestinians and a controversial figure. Two years ago, Keshon Newman’s older brother, Randle Young, was walking with his girlfriend in Chicago, Illinois when he found himself in the midst of a shootout. Young, just 16 at the time, was shot and killed. Since losing his brother, Newman has honored his life as an advocate against gun violence, which kills hundreds in Chicago every year. "This is why I'm here: Because we must stop letting this become the normal in Chicago," the high school student said at a conference in Washington, DC ahead of the March for Our Lives. 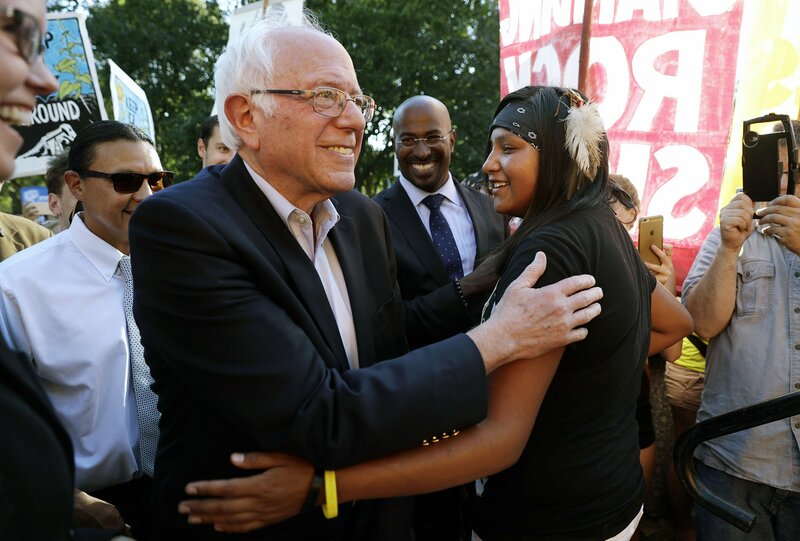 Sen. Bernie Sanders, left, greets Jasilyn Charger, a member of the Cheyenne River Sioux Tribal Youth Council, after Charger spoke to a group of supporters who were rallying in opposition of the Dakota Access oil pipeline on Sept. 13, 2016, in Washington. Lakota Sioux activist Jasilyn Charger spent months on the frontlines of the Standing Rock protests against the highly controversial Dakota Access Pipeline. And though President Trump has since passed an executive order to advance the pipeline, which cuts close to two Native American reservations, Charger’s activism is not forgotten. After her months protesting the DAPL, Charger, now 20, went on to found the International Indigenous Youth Council at Standing Rock, which aims to empower indigenous youths to be leaders of their community and protectors of their land and resources. “It doesn’t take an extraordinary person to do extraordinary things,” Charger told Democracy Now. “It takes one person to have the courage to stand up and to really say no, to really stand firm and not take no for an answer, to really persevere." Charger and the other DAPL activists remained on the frontlines despite the use of force by police officers hoping to disperse protesters. "We forget, as the people, that we have the power, that we have the power to change the system if we don’t like it," Charger said. “We don’t have to take that anymore." Global Citizen campaigns for freedom, for justice, for all. Take action here to use your voice as a force for change like these young activists.